The greatest gift as a parent you can give your child is to spend time playing with them. 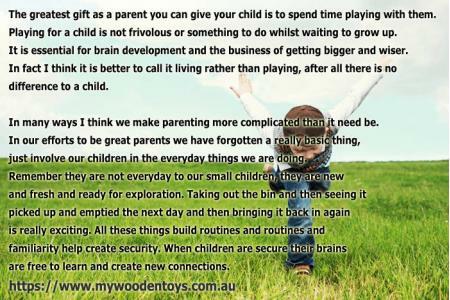 Playing for a child is not frivolous or something to do whilst waiting to grow up. It is essential for brain development and the business of getting bigger and wiser. In fact I think it is better to call it living rather than playing, after all there is no difference to a child. Don't make the mistake of thinking you have to stop what you are doing and "play" with your child. Make the everyday things you do a game. Tidying up, vacuuming, cooking all have brilliant potential for games and learning. For a while my wife and I fostered a little boy. One of his great loves was vacuuming and he learnt at three how to do a really good job and even how to take the vacuum apart and empty the dust into the bin. He would also follow me around the garden as I cut the grass, he used his toy pram as a mower. He copied my every move back and forth and loved spending time doing this. Afterwards we would talk about what we had cut and which bits were tricky and how funny it was when I hit my head on a low hanging branch. All those things are play / life and he would re-enact the head hitting part and laugh and then rush inside to re-tell the story to my wife and daughter. Such a simple thing and wonderful as you are getting your jobs done (always a challenge with small children) whilst at the same time providing stimulation and learning opportunities that a child needs. In many ways I think we make parenting more complicated than it need be. In our efforts to be great parents we have forgotten a really basic thing, just involve our children in the everyday things we are doing. Remember they are not everyday to our small children, they are new and fresh and ready for exploration. Taking out the bin and then seeing it picked up and emptied the next day and then bringing it back in again is really exciting. All these things build routines and routines and familiarity help create security. When children are secure their brains are free to learn and create new connections. When you are driving somewhere it is a great opportunity to sing songs, play word games, talk about what you are seeing. A favourite game of my daughters involved me singing a song and deliberately getting the words wrong. She loved correcting me. I learnt later that this is a really important part of development, being able to anticipate what something should be and recognising when it is different, I thought we were just having fun. When it comes to play you as a parent are a brilliant resource. Just think of all the things you have to do in a day and how your child can be part of those things. As time goes on this will also give you a really good idea of how you can extend your child, what activities they love and how you can easily add to your and their daily fun and learning.